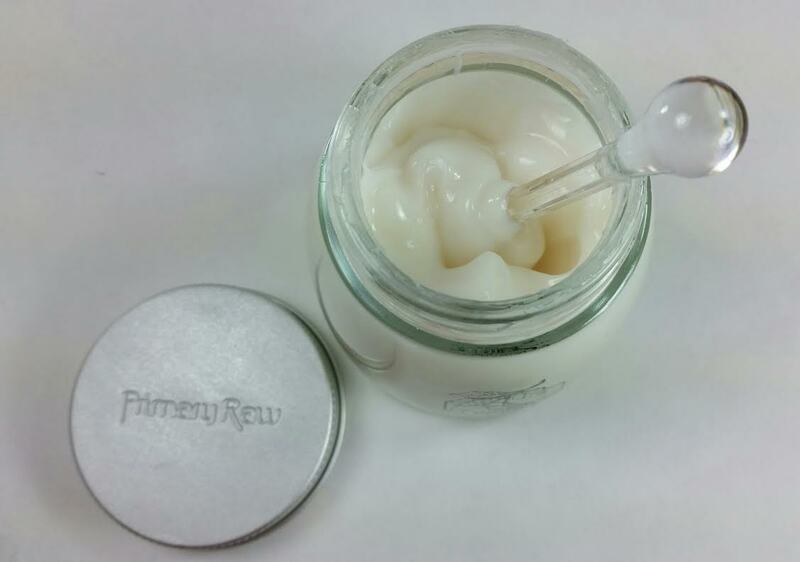 The Primary Raw DoYou Soy Milk Facial Cream is one of my new favorite things. It's one of the better moisturizers that I own and has nearly all the ingredients that I love to see in my face creams. I received this via Memebox courtesy of Primary Raw. 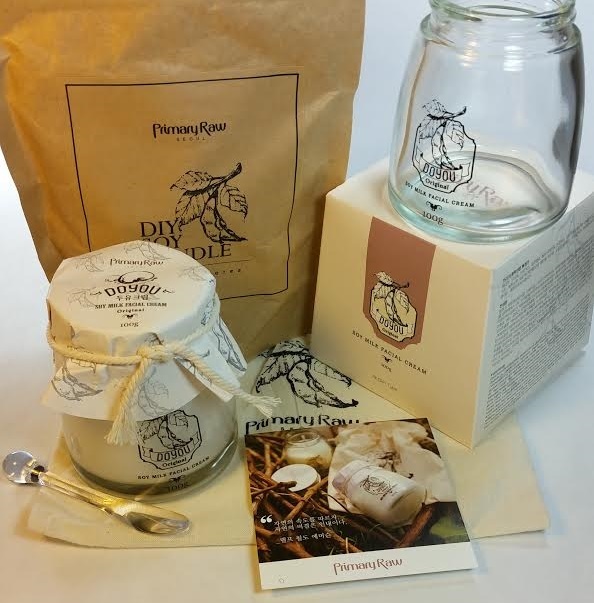 Included with the moisturizer was is a DIY candle that is also an encouragement to reuse your moisturizer jar when you've used all the product inside. Primary Raw Seoul, a natural cosmetics brand promoting use of ‘primary’ and ‘raw’ ingredients straight from nature, has launched its first Do You Cream (‘Do You’ means ‘Soy Milk’ in Korean). 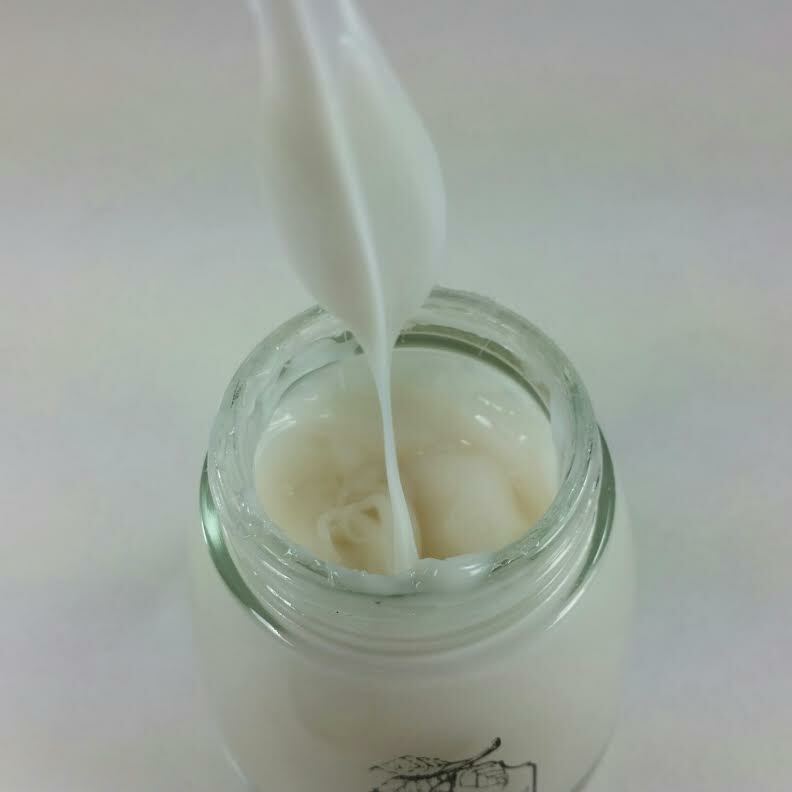 Enriched with soy bean extracts, soy milk ferments, rice water, galactomyces, and other grain extracts, this Soy Milk Facial Cream is deeply hydrating, gentle in formula, and brightens up uneven, dull complexion for a clearer and healthier glow. The DoYou cream does have an interesting and unusual texture. It reminds me of a toned down version of the Bounce Cheese Cream. This moisturizer strings! The directions indicated a need to pat this on and when I first used this, trying it on the back of my hand, it strung crazily all over the place! I was so surprised! I then read the directions more closely and I should have massaged it in first and THEN patted it which does not produce nearly the fun or effect. Oryza Sativa (Rice) Bran Water, Butylene Glycol, Dimethicone, Niacinamide, Cetearyl Olivate, Glycerin, Dipropylene Glycol, Glycereth-26, Caprylic/Capric Triglyceride, Tritcum Vulgare (Wheat) Germ Oil, Cetyl Alcohol, Cyclopentasiloxane, Cyclohexasloxane, Lactobacillus/Soymilk Ferment Filtrate, Sodium Hyaluronate, Snail Secretion Filtrate, Glycine Soja (Soybean) Seed Extract, Beta-Glucan, Morus Alba Bark Extract, Copper Tripeptide-1, Cetearyl Alcohol, Glyceryl Stearate SE, Algae Extract, Piper Methysticum Leaf/Root/Stem Extract, Camellia Sinensis Leaf Extract, Chamomilla Recutia (Matricaria) Flower/Leaf Extract, Ginkgo Biloba Leaf Extract, Acrylates/C10-30 Alkyl Acrylate Crosspolymer, Butyrospermum Parkii, Arginine, Aloe Barbadensis Leaf Juice, Caprylyl Glycol, Ethylhexylglycerin, Troplone, Lactobacillus/Aspergillus/Prunus Mume Extract Ferment Filtrate, Lactobacillus/Portulaca Oleracea Ferment Extract, Natto Gum, Angelica Gigas Root Extract, Phellinus Linteus Extract, Allantoin, Panthenol, Glycyrrhiza Glabra(Licorice) Extract, Mannan, Acetyl Hexapeptide-8, Tocopheryl Acetate, Camellia Sinensis Leaf Extract, Avena Sativa (Oat) Meal Extract, Lysolecithin, Soy Isoflavone, Sodium Polyacrylate, Pyrus Cydonia (Quince) Seed Extract, Disodium EDTA, Ceramide 3, Ubiquinone, Caramel, Citrus Aurantium Bergarnia (Bergamot) Peel Oil, Citrus Limon (Lemon) Peel Oil, Cananga Odorate Flower Oil, Juniperus Oxycedrus Fruit Oil, Salvia Officinalis (Sage) Oil, Geranium Maculatum Oil. I was most encouraged to use this by the packed ingredient list. Since Primary Raw prides itself on being natural and/or from the earth, there are more plant derived antioxidants in this than I care to list out. It also has niacinamide for skin brightening, glycerin as a great humectant moisturizer and my beloved soy ferment filtrate. Also on the list is sodium hyaluronate in it's smallest, most absorbable form for the best possible hydration delivered deep into the layers of the skin. Guess what else it has?! Yep! 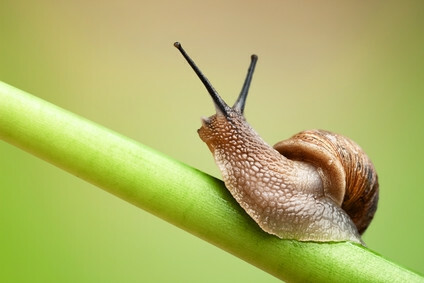 Snail Secretion Filtrate is rich in Allantoin, Glycolic Acid, Elastin, hyaluronic acid and Collagen. It works to provide moisturizing, antioxidant, protective and regenerative benefits. It's also been found to be beneficial to the healing and minimizing of scars, minor abrasions, acne and wrinkles. So basically it's magic. And I want all of that in my skin! Not only that it's got 2 kinds of peptides along with Vitamin B and Vitamin E. With all of this I could only hope my combination skin loved it. Happily, it does. I've found that this cream is very gentle on my skin and I think the Soy Ferment Filtrate has something to do with that. I've really had wonderful results with anything containing soy ferments. I don't know why. My combination skin had no issues with using this. I experienced no breakouts and my skin always feels silky smooth after use. I do have to mention that there is such a thing as too much and then the skin can take on a sticky feel but I swipe with toner on a cotton pad and that eliminates the issue. I've been using this for the better part of three weeks as my regular night time moisturizer and have been very happy with it. I should mention that I've read some other reviews and it seems that if you have really oily skin, you probably won't like this and if you have super dry skin, it may not be enough for you. With my combination skin, I'm always happy to find a cream that I can use on both my dry cheeks and my oily T-zone and this really does hit the spot for me. Sadly, this is no longer available on the Memebox website but you can add it to your wishlist! It's in stock! Grab it here while it's available! Or get it from Primary Raw themselves although I don't know about shipping costs. You can also see all the other things Memebox has to offer here on their website. They've been expanding their shop and adding new products regularly which is good. Memeboxes themselves have been slowly trickling in and you can see those here. *affiliate links were used in this post. This product was received free for review purposes. No compensation was received and all opinions are mine. Snail cream products always interest me. I have oily skin that's sensitive too so it's encouraging to hear that this was gentle on your combo skin. I'd definitely be interested in giving this a try. There is a point where too much was too much but I never did break out, thankfully. I'm always bummed when I find something nice and then it doesn't agree with my skin. Isn't the texture interesting? I like it better than the cheese cream, too. It's lighter. Between the stringy texture and the packaging, this stuff SERIOUSLY reminds me of fancy yogurt. Sadly it wasn't a total hit for me (not quite hydrating enough), but the presentation is really lovely at least. I really like it which worked out. I wasn't expecting to in the slightest. I don't know if it would be enough if I used it in the morning and then went outdoors in the cold but I have other morning moisturizers that I'm using so I never tested that. What I didn't mention because I didn't think of it was the fact that I hate the jar. It's just not a shape conducive to easy use and getting that last drop. OrangeGlad 45% off Coupon Code! Julep January 2015 Deals and Coupons! Golden Tote Mystery Tote SMALL On Sale Now! Glossybox January 2015 Spoilers and Coupon Codes!